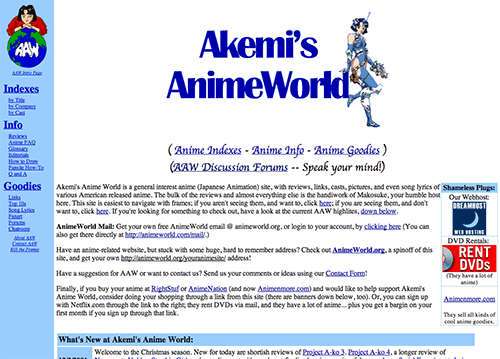 The relatively brief and not at all illustrious history of Akemi's Anime World. AAW has been around since the late '90s, which is a rather long time by web standards. The site has gone through a lot of gradual growth and a few drastic design changes since then, and even I seem to have trouble remembering some of them, so a probably-not-brief-enough history seems in order. For the truly curious. Thus, after going over 13 years' worth of archived files (advantages of being a digital packrat), the definitive AAW history is written. If you have any comments or recollections on AAW past, by all means, share them with us! Oh, and incidentally, the past 12 years' worth of site updates are available in our archive as well. Akemi picked the blue for the title--what came to be known as AAW Blue (#99CCFF, if you're a geek). 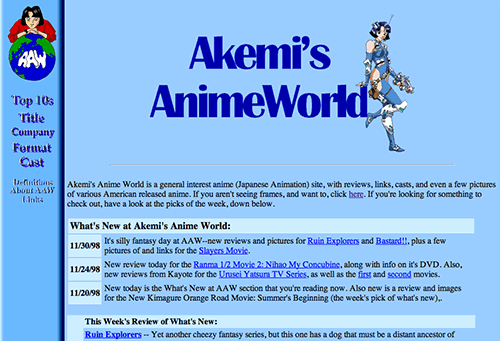 I kept fiddling around with AAW through most of 1998 until a fateful day when I realized someone had beat me to registering AnimeWorld.net. I cursed myself for my indecision and quickly registered AnimeWorld.org, which was still left, that day (October 27, according to the registration info) before going home from work. Having spent money on the thing, I felt obligated to actually do something with it, and so sometime that november I declared the site official and started submitting to search engines (see, in those pre-Google days, search engines were like Soviet Russia--they didn't come to you, you went to them). That is one seriously blue site. Not entirely sure what I was thinking. AAW's official birthday, however, is January 1, 1999. 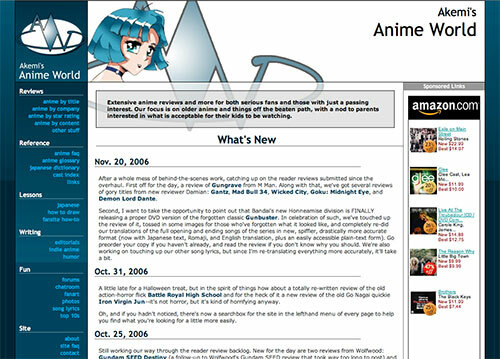 See, by a fluke stroke of luck, whoever had hoarded the AnimeWorld.com domain name didn't bother to renew it that year. I'd been desperately hoping for this, and jumped on the registration the moment it became available--and somehow actually got it. 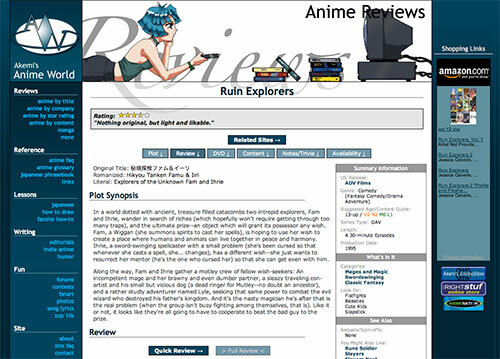 After some additional adjustments the site was re-launched at AnimeWorld.com seconds after midnight on New Year's Day, 1999--I took time out from the party to click the upload button. That's got to be worth geek cred somehow. You can even poke around via the magic of Archive.org's WayBack Machine. The only visible difference was a more detailed menu. What the review pages looked like. 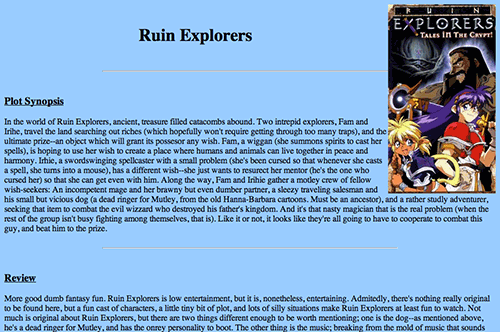 The example is Ruin Explorers because there wasn't much else to choose from and it had box art. 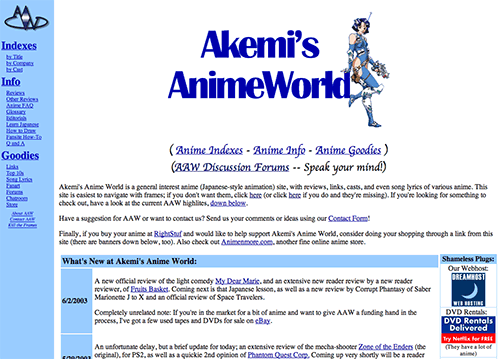 Once the site was switched over to the .com domain, we were left with an extra .org version, which became AnimeWorld.org, a URL forwarding and free email service. After a while the provider we'd been using for email stopped their free version, and the forwarding service continued for a while longer before it became too cumbersome to maintain and we shut it down. 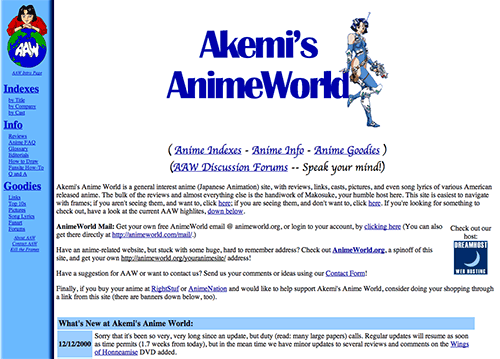 AnimeWorld.org is currently being used to serve media for AAW to speed up load times by a few milliseconds. 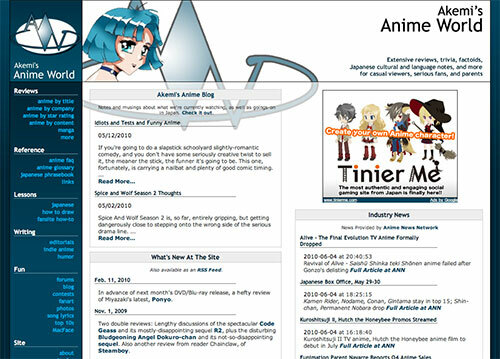 AnimeWorld.net was a very similar style of site, so I had something of a one-sided mental competition going with "the other AnimeWorld" for a while. The owner lost interest after a couple of years, and the domain ended up bouncing from a squatter to some Korean firm over the next few years. Guess that means I won. 2000, in addition to the world not imploding due to the Y2K bug, had me traveling to Japan to get married to Akemi, as well as make some commentary on Japan and anime that hadn't even been fansubbed yet. It also saw the blue background finally dropped for easier-to-read white, as well as the birth of the forums and reader reviews. Try out an archived version. Ahh, thank God, no more blue. This period also saw the switchover of the forums from the primitive early UBB software to the more advanced YABB. In 2001 Arcane and Legion, two folks who'd submitted a number of reader reviews, were added as official reviewers; both continued in that role for several years until life took them elsewhere. Things continued that way for a while, with reviews collecting and the forums slowly growing. 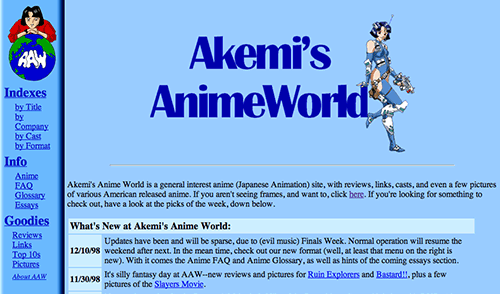 In 2003, Akemi designed a logo for the site, which replaced her symbolic visage in the corner. Some more cosmetic changes to the menu happened a little while later. In hindsight, the logo didn't look so hot in the initial iteration. 5 years and I still hadn't bothered to fix the horizontal bar overlapping the box art. Not so sure all those lines in the menu was a change for the better. 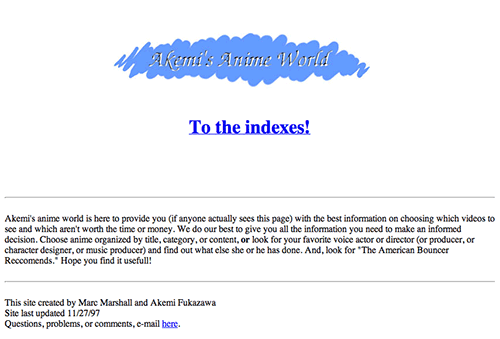 About halfway through 2005 I decided it was time to tap Tachihohe for a more professional layout and apply the considerable improvement in my own HTML/CSS skills to AAW. The rebuild was progressing nicely, with a target launch date of the beginning of 2006, when my health started to falter and things got ugly. 2006 was not my year; I developed a debilitating illness that had me bedridden for most of the year and very nearly killed me. It wasn't all darkness, though; after getting well enough to at least sit up, I took advantage of all that time stuck in bed to go all-out on the AAW makeover. This included converting most of the backend over to an automated WebMake-based system, which is invisible to the reader but, in the long run, made maintaining AAW drastically easier. The new look and system finally went live in late 2006. Now we're starting to get somewhere, appearance wise. You can't see it in a screenshot, but the other big change at that point was a concentrated effort to improve the quality of the writing on the site. A lot of time was spent editing and pruning the longest and most unwieldy of the old reviews, and Loretta jumped in to help with some professional-grade editing. 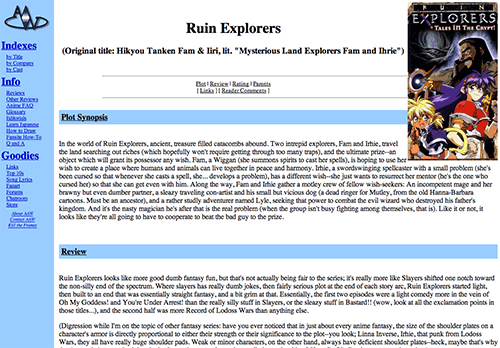 The reviews improved drastically, and we added a bunch of meta-info to help you find related anime and figure out what, objectively, is in the show. Once I had recovered enough to get back to my day job, I started playing catch-up on all the stuff that you let slip when you're out of the world for a year or two. This resulted in the next couple years being rather quiet at AAW, with only a gradual trickle of new material. 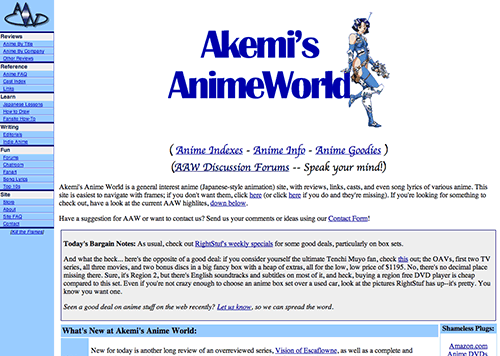 Akemi herself did start experimenting with a blog about Japanese news in 2007, which was converted to an anime blog a while later. The front page got an overhaul, adding a newsfeed. This will, I hope, turn out to be AAW's next big step. Around the middle of 2009 I decided AAW was too good of a resource to disrespect, and again sat down at the drawing board with Tachihohe to apply my further-improved coding skills to a new, modernized look, better information presentation, and info that's more fun and hopefully also more useful. Fifteen months of development followed: 52 design iterations, a manual once-over of every page on the site, data and pithy comparisons added to all 400 reviews, and updates or substantial edits of at least 50 reviews. If you're reading this, you're looking at the result, which is hopefully worth the effort (because it's gonna be here for a while--the design had darned well better last at least a few years). It remains to be seen whether my vow to keep steady content updates coming will be fulfilled, but here's hoping.